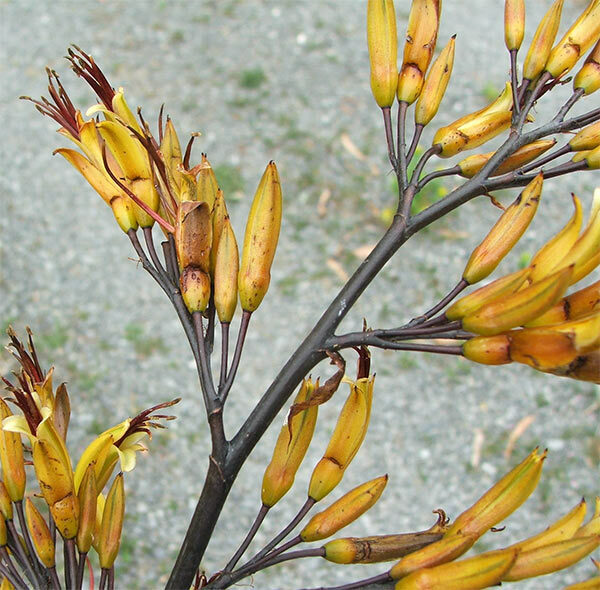 Many of New Zealand's much loved landscaping plants are spiky. 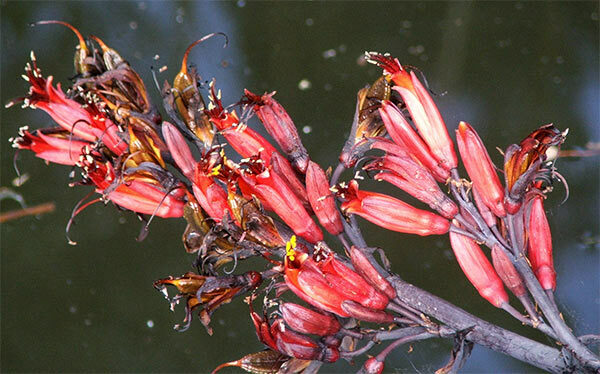 The big stiff flaxes, Phormium tenax, are a natural feature of much of our land, as are the iconic Cabbage trees, or Cordylines. Hybridisers have worked long and hard to provide home gardeners with smaller, coloured, well-behaved versions of these spiky species. 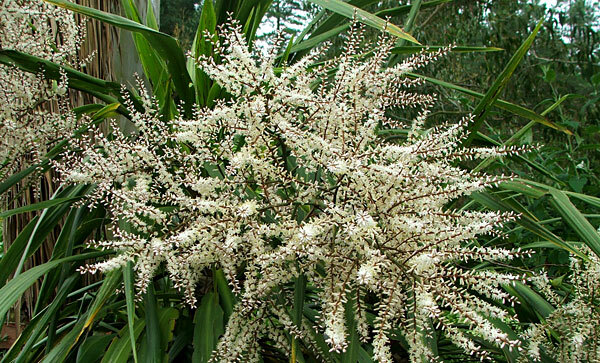 There are small weeping pink flaxes and small red weeping Cordylines, just waiting to fill a stylish silver pot and adorn your courtyard. These plants start coming into flower in early summer (or late spring, depending on observant the gardener is). What dramatic and interesting forms the flowers are! The basic drab green Cordyline (which we call a Cabbage Tree - nothing to do with cabbages) is a messy plant. It grows a fibrous trunk, sheds its lower leaves, and can be over-appreciated by caterpillars. But when it is in flower - magic! 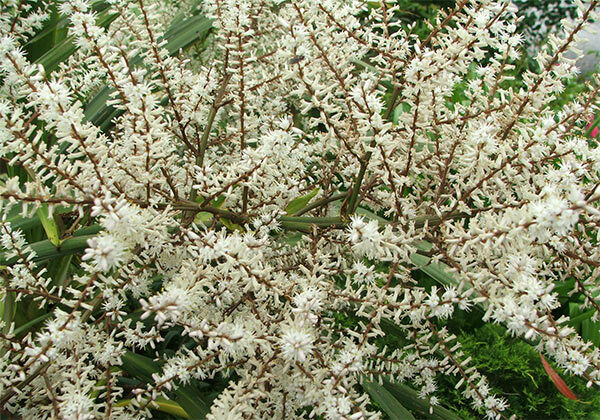 Huge criss-cross flower-heads of cream puff out of the Cordyline's body early in December - just in time for the warm summer sunshine. Flaxes flower in a strange, exotic way. Their flower-heads start off as stiff covered spears, which unfold to show an array of petals, followed quickly by gleaming seed pods. Some are predominately wine red and black, others yellow, others shiny green. These dangling ornaments are extraordinarily beautiful - and difficult to take respectable photographs of! The bellbirds will hopefully come and feast on the nectar. It's not uncommon for little field mice to scuttle up and down the stalks, something which reduces Rusty the dog to a squeaking wreck. Some years the smaller coloured hybrids flower, some years they don't. In some of my larger flaxes I never bother to cut down the old flowering stalks. Their grey-brown silhouettes are very sculptural - well, that's my excuse! Flax flowers can be cut and used in elegant indoor arrangements. It's good to remember that these strong, spiky plants have a soft, flowery side!